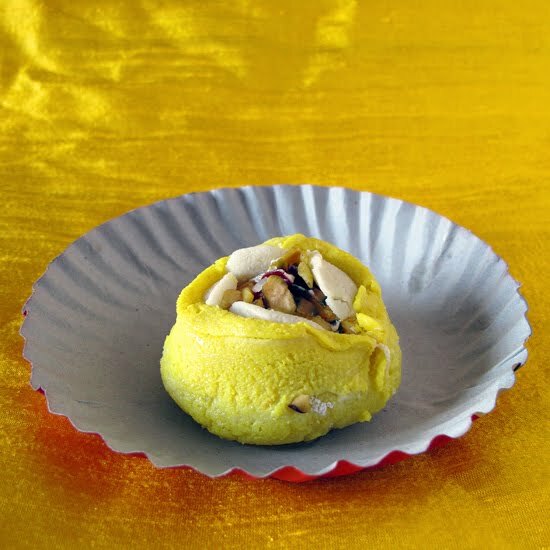 Of all the Indian sweets I've tried -- this sweet yellow sugar bomb is my favorite -- a combination of barfi (condensed milk and sugar, with a fudge-like texture) and jalebi, it resembles a cupcake on acid. The interior cake is soaked and dripping with sugar water and the outside is covered in a milky frosting/fudge substance... It's so sweet, it hurts my head and my teeth -- but it's SO good. Topped with a few almond slivers, silver leaf and a candied cherry, it is a feast for the eyes as well as the tummy. I'm sure it's the smallest thing with the most amount of calories I've ever eaten (D looks at me like a crazy woman when I order one of these) -- but everyday is a work-out in Panjim, what with the bus-riding (abs to hold the body up as it speeds and bumps along the road), walking to and from market to house, carrying home groceries, swimming to escape the heat . . . A girl must indulge! i want a cupcake on acid. so bad.